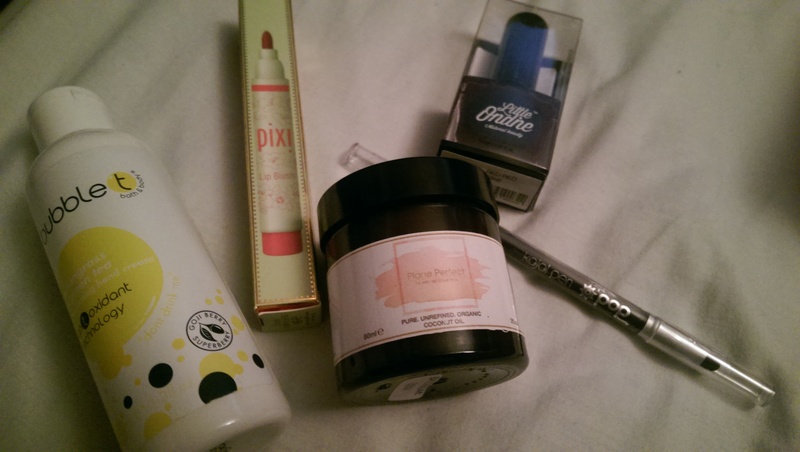 This month’s Dollibox just popped through the door with five full size products for £10. Bubble T Hand Cream in Lemongrass & Green Tea – paraben and SLS free, this hand cream is lightly scented and keeps hands soft. Pop Kajal Pen Eyeliner in Inky Purple – a dual ended pencil to deliver a splash of colour to your lash line. Coloured liner is big news this year. The Hippy Bee Collection Plane Perfect – coconut oil that you can take on a plane as it comes in under the allowance. Use it pretty much anywhere, probably my favourite multi use item.